The Handstand Push Up requires tremendous levels of “functional” strength. Calisthenics is often overlooked as an effective method of developing strength, and conditioning the body. This is because people ASSUME that lifting heavy weights in the ONLY way to develop “big” muscle and experience huge strength gains. Let me tell you…that assumption is wrong…very wrong. In this article I’m going to explain exactly what the benefits of Calisthenics training are and why you should be keeping yourself in shape using nothing but your own bodyweight. Let’s start by answering a few commons questions. In my opinion, functional strength is “usable strength” that you call upon at a moment’s notice to get you through any situation. For example, jumping fences or ditches, crawling under low hanging objects, pulling yourself up and over a ledge, or pushing away an attacker. These are some basic examples but there are literally thousands of daily activities than require functional strength. How can I develop functional strength? I believe that the best way to develop functional strength is by combining the benefits of Calisthenics, Isometrics and Plyometrics. “Old School” Calisthenics are made up of various “simple” body weight exercises that help you to build lean hard muscle, increase your flexibility, and increase your strength. By “old school” Calisthenics, I’m referring to the Calisthenics exercises used by the strongmen of previous eras, not the high repetition, endurance type of training that usually defines “modern” Calisthenics. The benefits of Isometrics complement the benefits of Calisthenics very well. However, Isometrics are different in that they involve no range of motion – just static holds. Bruce Lee, the man who bought Martial Arts to the Big Screen was a huge fan of Isometric training, Calisthenics, and Plyometric exercises. He was also renowned for his lean, muscular physique and his incredible strength. Many bodybuilders and fitness athletes perform Isometric training to give their body the most aesthetically pleasing physique. You can perform Isometric holds simply by contracting and holding a given position until failure. For example holding a prone bridge position until you can no longer hold good form. 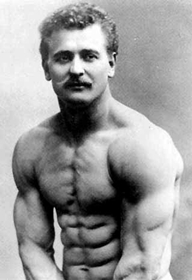 Eugene Sandow – A “performing” Strongman from the late 1800’s and early 1900’s. This was in the day before gyms and “modern” bodybuilding. Calisthenics played a huge part in his physical development. The benefits of Plyometrics are another great complement to the benefits of Calisthenics. This is because they consist of “quick twitch” exercises that help to develop explosive power. When you perform these exercises you are using a short sharp burst of power to complete the action. For example a box jump where you explosively jump up onto a box or a Plyometric push up where you explode upwards so that your hands come off the ground briefly. Is it difficult to develop functional strength? The answer to this is no…it is not difficult to “develop” your functional strength if you know what you are doing or follow a great training program. Also, you will experience most of your strength gains in the early stages of your training and those gains will come surprisingly quickly. HOWEVER….I will say this….it won’t be easy. You will have to train hard and consistently but the results will be worth it. You will end up very strong and with the added bonus of a lean, muscular body. No. Just because Calisthenics is comprised of exercises that many consider “basic” such as press ups and pull ups does not mean that they are out of date. In fact, the benefits of Calisthenics as a serious strength training tool is being seen more and more as it is becoming more and more popular. Another point to be made is that Military and Police fitness programs rely heavily on the benefits of Calisthenics, Isometrics, and Plyometrics to get their soldiers and officers into peak physical shape for the “real world”….just look at the elite U.S Navy Seals! How do Calisthenic exercises compare to other ways of getting in shape? It is a fact that in today’s sophisticated day and age many people tend to overlook the simple things…especially if they need manual input from the user. People prefer to use machines and technological advances that make their lives easier. This reliance on machines and technology also crosses over into fitness training. If you turn on the TV you will see countless ads for the latest and great fitness product or workout program that “revolutionises” fitness training. This is because there is HUGE money to be made in this industry. There are literally millions of people out there who want to burn fat and build muscle and are prepared to pay for results. The thing I hate the most is that most of these advertisers will even tell you how these “revolutionary items will make it quicker and easier to attain a “beach body”. What a load of crap! Here’s a clue…if they say it’s easy, it won’t work. 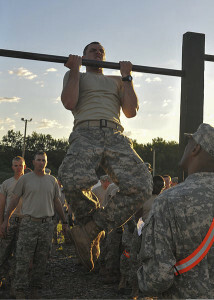 As you can see, the military are still using Calisthenics to develop the required level of strength for soldiering. I’ll also make this point….there are only a select few of these TV workout routines that are honest with their audience in that they get results and don’t try and sell their program by saying it is easy. An example would be the P90X series of workouts which funnily enough consists mainly of Calisthenic, Isometric, and Plyometric exercises. Well, one of the biggest benefits to calisthenics is that it improves functional strength. Another of the benefits of Calisthenics is the practitioner’s ability to “scale” the exercise for their needs. For example, if you can’t do full depth press ups yet, you can “scale” them down and do incline press ups or press ups on your knees instead. Therefore the benefits of Calisthenics can be reaped by young and old due to the scalability of the exercises. One of the best benefits of Calisthenics is the increase in your overall stability. Because functional strength and stability go hand in hand, once you are able to perform the advanced level Calisthenics exercises, will push you to the limits of both your strength and stability. For example, can you imagine how strong and stable your body has to be to perform handstand push ups! To show you exactly how strong you could be, check out the video below of Frank Medrano. Frank is a true athlete and this video will show you what kind of strength you can expect after years of Calisthenics training. Are there any decent Calisthenics programs I can follow? The good news is that there are several. If you just can’t help yourself and are interested in a workout program advertised on the TV go for P90X. If you are serious about Calisthenics you will want to know more the exercises as well as how to do them properly. I suggest taking a look at the books written by Al Kavadlo and Paul “Coach” Wade. I hope this has been informative enough for you and has shown you the benefits of Calisthenics and how doing them will greatly increase your functional strength and stability. If you want to stay up to date with whats happening in the world of Calisthenics, subscribe to our newsletter below. My uncle was big into Calisthenics, but I still have problems spelling it. I will say thought that he looked far better than most of the posers in my local gym. Eoin, your uncle sounds like a smart (and strong) guy. Calisthenics is a great form of exercise that is perfect for everyone. Glad you liked the article. I may have to try some calisthenics after reading your article! Calisthenics is a great way to get in shape with minimal equipment and cost. You’ll find plenty of info here at S&S to get you started. I hope to see you back here soon. Great post! Very informative, I’m sure this will be useful to a lot of people. Thanks Tim…I’m glad you liked it. Feel free to look around our site. Take care. Great advice, I’ve ised the P90x program and it works great. I got stronger, lost a pile of weight then summer came. I don’t have as much free time and camping kind turns my eating habit and choice of foods inside and out. Are there other-programs lime p90x out there? I’d like to try something different. Dan, thanks for your input. P90X is actually one of the “as seen on TV” products that works (I’ve used it myself in the past). The best program in my opinion for people new to calisthenics is YAYOG by Mark Lauren. The DVD set is available in our store. Thanks for commenting. I hope to see you back here soon. Great post, some great tips here for getting buff. Those handstand pushes look really tough. Jason, thanks for the comments. Sure…handstand push-ups are hard but you don’t dive straight into them, there are progressive steps, so if you follow the progressions you’ll be knocking them out in no time!